How to choose the best collar for your dog and our top picks! Every dog needs a collar, it’s there own personal means of identification and whilst they serve a number of purposes, primarily we need to have a way to identify them should they get lost or escape! 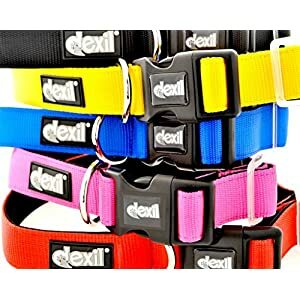 Dog collars come in a wide range of styles, sizes, and colors and there are all sorts of different types for different purposes – so many that it’s easy to get overwhelmed, confused and possibly end up with something totally unsuitable for your dog. So we have done the hard work for you and put together a shortlist of our favourites. In this ultimate guide, you will discover the different types of dog collars and what they are used for, to kick off you can see a handy comparison table with each product, its rating and price, you can read more about each product below or jump straight to the buyers guide. Hopefully, that list has clarified the different types that are available. As well as the different types, there are also different collars for different purposes and activities. We have taken an in-depth look at some of these and selected our favorite ones below. Most dogs need to get out every day – at least once! Exercise is an important part of your pooch’s daily routine and it’s a requirement for keeping your dog’s muscles and bones healthy. Walking can also help to prevent your dog from destructive behaviour like chewing on things. It’s also a good chance for your dog to urinate/eliminate when necessary and socialize with other dogs/puppies. So when picking a general collar for walking what should you look for? Petcomer is under the umbrella company Shanghai SENFUL Corporation. The company offers a wide selection of budget pet accessories for pet owners who are searching for products with style and functionality. 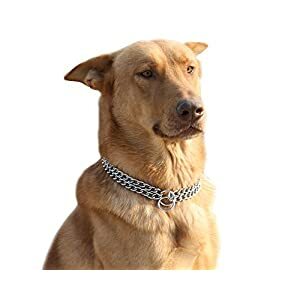 This dog collar is made of soft mesh padding. It’s comfy and breathable. The unit also does wear on the canine’s fur/skin. The buckle is durable and lightweight. It has a big loading capacity, which improves the buckle’s tensile strength. Another benefit of the buckle is it’s quite easy to put on. The leash attachment points include O-rings made of zinc-alloy. This provides durable and anti-corrosive units. The collar is also fully adjustable, so it’s easy to fit for your pet pooch. It’s important to review the size chart when placing an order to make sure you order the right size for your canine. The collar includes 3M reflective material. This provides good visibility from the road at nighttime. This in turn will help to keep your pet as safe as possible. Blueberry Pet focuses on developing quality pet products. It offers a wide range of products including pet toys, collars, harnesses, leashes, crates, etc. The company’s philosophy is to treat customers with high-end service, and it explains the company’s strategies. This Padded Dog Collar is available in neck sizes ranging from 37cm to 50mm. Meanwhile, the whole webbing width of the Medium collar is 2.5 cm. The width of the neoprene layer is 2cm. The collar is one product. However, you can also pair it with a lead/harness, so you create a complete look. Keep in mind these items are sold separately. One plus of this collar is the classic print that includes a new take on it. Roses are printed in a colour combo to create a spring-like combo of pink and green. This makes the dog collar a good choice for daytime or special event. The collar is constructed from a polyester webbing that’s high-density. There’s a bottom layer constructed of comfortable neoprene made of synthetic rubber. Neoprene provides high-end chemical stability and keeps its flexibility in a wide range of temperatures. There are other features that add to the durability of the collar. The D ring is chrome-coated for extra durability. Meanwhile, the grey buckles are constructed from “green” plastic. The loop that’s tied to the loop is designed specifically of attaching it to various items like dog tags, charms, or accessories. However, you shouldn’t use this loop to attach a dog leash. It’s important to note the collar doesn’t stretch by itself. 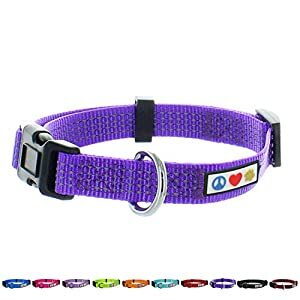 Make sure you can only fit 2 fingers between the collar and dog’s neck. This will prevent your dog from chewing through the collar. You should avoid leaving your dog not attended while wearing the collar. You should also measure your dog’s neck to make sure you’re ordering the right size. You can confirm which size you need by reviewing the size chart for the weight range. The 2-row dog chain has an eye-catching design while is still durable/functional. It’s constructed from strong stainless steel. This means you won’t have to worry about the collar rusting/tarnishing. It’s also designed to maintain a long-term polished finish. This stainless steel dog collar is available in 3 sizes/lengths, and each unit includes 2 rings. Before ordering the dog collar, it’s important to measure the dog’s neck in order to pick the right size. This collar is a good option for gentle control. The stainless steel won’t irritate the dog’s skin, and smooth chain keeps the dog as comfy as possible. It’s also chrome-plated to provide extra strength/durability. When using this dog collar, it’s critical to use it only when it’s on a leash. In turn, this will help to prevent possible safety issues. Moonpet offers a satisfaction guarantee. This is a plus since it helps to protect your investment. Make sure to read the guarantee’s fine print, so you’ll know exactly what it covers. Dexil focuses on offering products with high quality and reliability. This provides the best experience for pet pooches and their owners. This is true whether you’re at home or walking in public at the park or around the block. The Adjustable Dog Collar is fully adjustable. You can adjust the length from 38cm to 64cm, while the width is 3cm. This dog collar is neoprene padded. This is a kind of synthetic rubber. It was developed by DuPont in 1930 and was originally known as Duprene. Today this material is used in a wide range of products including auto tires, coatings on exercise weights, wetsuits, etc. The unit’s components are made from durable components. It also includes anti-corrosion D ring, which helps to extend the lifespan of the items. It’s also waterproof so you won’t have to worry about the collar getting rusty if your dog spends time outdoors in the rain or swimming in a pool, lake, etc. The collars are available in two sizes. This provides two neck lengths and widths. It provides more versatility so you can find the right collar for dogs of different sizes, breeds, etc. The Padded Adjustable Dog Collar offers a 15-year guarantee. This is quite generous compared to other units on the market. This will help to reduce how many collars you’ll have to buy over the lifespan of your dog. The company also offers a color-coded awareness. This helps to prevent your pet pooch from being involved in accidents. This is definitely critical to help keep your dog as safe as possible. 5. 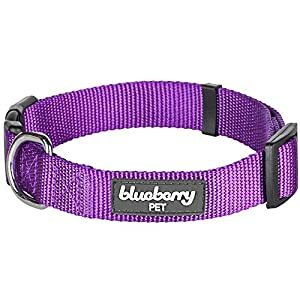 Classic Nylon Dog Collar (Dark Orchid, Small) by Blueberry Pet. 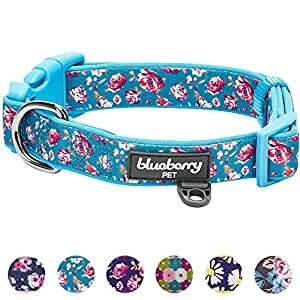 Here’s another dog collar from Blueberry Pet. We really like the wide range of pet products like collars, harnesses, leashes, toys, beds, etc that they have to offer! This collar is colored Dark Orchid. The collar is available in neck size ranging from 30cm to 40cm with a width of 1.5cm. 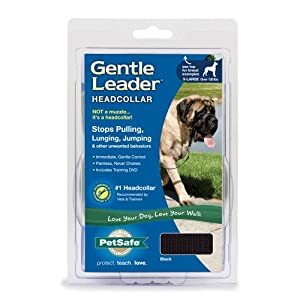 It’s a small collar so it’s critical to make sure to measure your dog’s neck correctly so you can pick the right size collar based on the company’s in-house size chart. The collar offers durability through the nylon fabric w/ high-density webbing. Another plus is the buckles are constructed from strong yet eco-friendly plastic. This makes the collar as friendly for the environment as for your pooch. This collar isn’t for tie up outside or being left alone. You should also avoid keeping your dog unattended when wearing the collar and make sure you’re with your dog whenever they are wearing the collar. Pro Tip: Make sure to take note that the collar doesn’t stretch on its own … so when sizing your dog for the collar make sure there are just 2 fingers in between the collar your dog’s neck. The collar shouldn’t be too tight, which can cause discomfort for your dog. It also shouldn’t be too loose, which can allow your dog to chew on the collar and free itself from it. It’s also worth noting that this collar is one product. You can purchase a lead/harness separately. This matches up well with the collar to get the best results. If you want to provide the best setup, then you should consider this combo. The Pawtitas tender training collar is perfect for developing pups who may gain from a more gentle grip. Dogs, particularly those from the early training stages, might not require the strength and bulk of a bigger collar, and also the Pawtitas is a superb way to keep them secure without getting in their own way. The 13 colours also include a reflective strip that’s intended to reflect ambient lighting during the night or in low end ailments. Owners notice you ought to put in a few centimeters into the length to correct for developing pups. Even though a harness might be better for a few pulling pups, it is essential to locate a solution which is suitable for your particular pet — along with also a gentle chief is a fantastic training tool for several dogs. It is supposed to suppress excessive pulling, tugging, and barking, and it’s only used while your puppy is learning the ideal way to walk on a leash. It comes in five different sizes and eight colors, and has a training video to assist owners understand the best approach to utilize a pioneer. The PetSafe pioneer has several avid fans that claim it is the first product which created their walks more agreeable. Additionally, it is a excellent selection for fearful or aggressive dogs; owners say it will help them readily restrain lunging and barking. We adore the PetSafe Gentle Leader since it is effective without rubbing or chafing, also uses a two-loop layout (looping round the neck and also the nose), allowing for optimum control with really powerful dogs. So there we have our round up of the best collars for general everyday use. Have you any favorites that we have missed off – or any that you think should be included? Don’t hesitate to drop us a line and let us know – we would love to hear from you!